This charger is not compatible with Italy/Switzerland/Brazil/Chile 2-prong outlets or South Africa 3-prong outlets. 110V devices can't be used in 220V or other higher voltage countries. Device's voltage rating must match a specific country's. 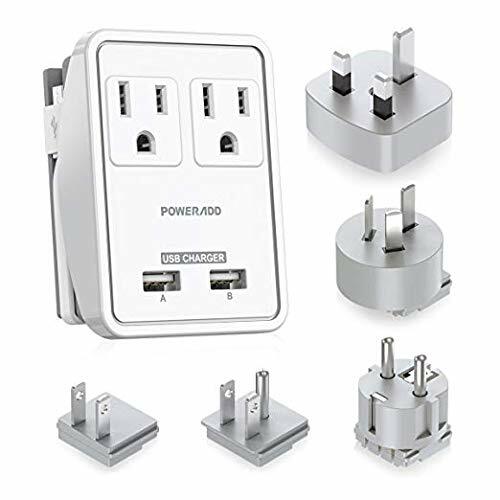 This universal travel charger is a brand-new and upgraded international adapter. It's well designed to be portable in size with a simple and practical style. USB ports, Micro USB connector and all plugs are user-friendly. It's a perfect handy unit for traveling and business trips based on its durable quality and powerful functions. This travel charger also features in its dual USB port design,2 ports (max output 2.4A). which enables simultaneous recharging for your mobile devices. Port A, specially designed for Apple products and tablets while Port B works for other cellphones and devices. Besides, an embedded Micro USB cable and connector is helpful to multiple mobile devices' recharging. It comes with 5 international wall plugs. This makes it ideal for cross-border traveling. covering more than 150 countries over the world. The travel charger is made of highly durable sturdy plastic. It has superior craftmanship and simple design. Micro USB Connector: For charging micro usb enabled devices.